The bolt-on Argonics sidewall protector is designed to lessen the potential for sidewall cuts and punctures in such applications as concrete recycling and aggregates production. 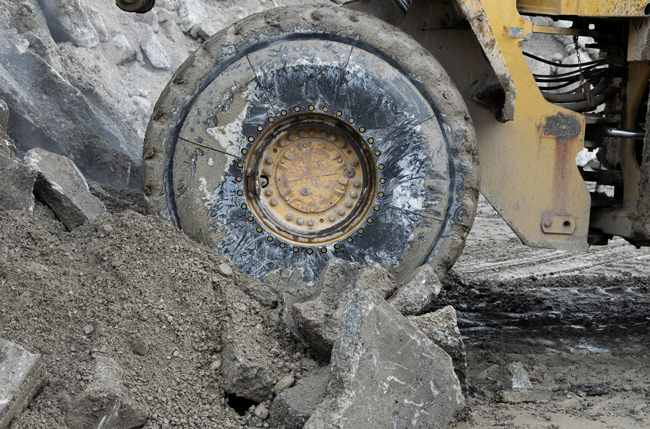 Argonics has developed a sidewall protector for wheel loader tires. The sidewall protector uses a proprietary urethane formulation, Kryptane, which was engineered for extreme conditions in applications involving abrasion, sliding, or impact, the company says. According to Bob Welker, director of marketing, the patent-pending urethane sidewall protector is in its fourth generation. Currently, he says, the design is based on a 25-inch wheel diameter, but the company is planning sidewall protectors for 33-inch and 45-inch wheel diameters.